Romancing SaGa is the first in a series of RPGs by Square. There were plans for a US release, but it did not come out. There are no fan translation of this, so I cannot comment too much on this. It is a turn based RPG by Square, with graphics that are worse than Final Fantasy II (sad considering it was pretty much a launch title). 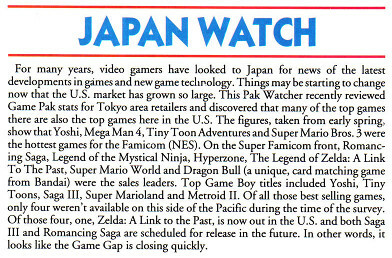 The March 1992 issue of Gamepro and the June 1992 issue of Nintendo Power mentions that there were plans for a US release (late 1992), but obviously that didn't pan out.